It's time for me to make a little confession: when Instagram Stories were first unveiled, I refused to use them. I didn't see the point – wasn't Instagram enough as it already was? Nearly a year and a half later, I post to my story daily and it's worked wonders for my business. You may have seen templated Instagram Story prompts going around on Instagram, which allow you to essentially "fill in the blanks" about yourself to share bits and pieces of your life with your audience. These have caught on like wildfire, and they're helping us connect like never before! 1. Your Instagram Story doesn't have to be as curated as your feed...so why not have fun with it? Post silly GIFs, share Boomerang videos of yourself being weird – it will be gone in 24 hours' time, anyway. The same goes for my Story prompts: they're fun and allow you to show your silly side. You know those days where you feel like you should post something to Instagram...but don't know where to start? These Instagram Story prompts will help you put yourself out there. If you know me, you know that I believe in well-designed...everything. These three Instagram Story prompts are sleek, fun and will have you sharing more about yourself in no time. 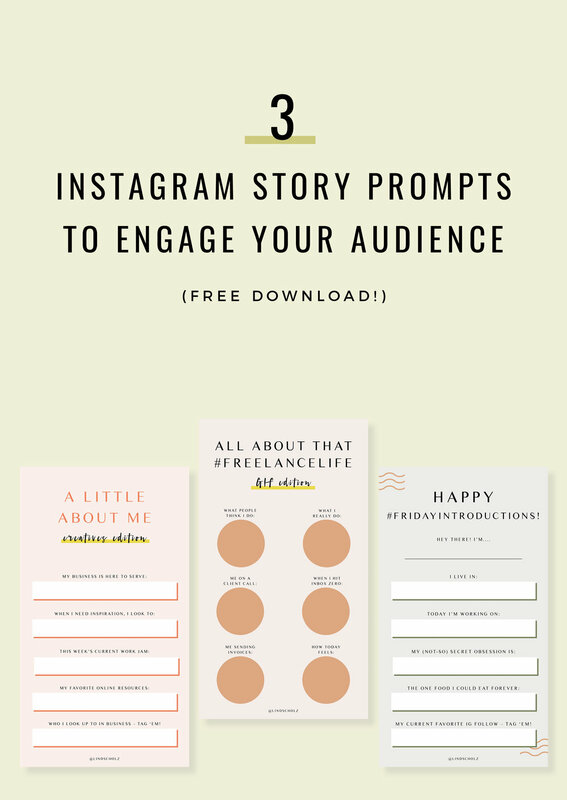 Ready to grab your free Instagram Story prompts? Let's do it! Thanks so much! Download your three Instagram Story prompts HERE. Enjoy!